and check out the AI adjustments and bug fixes in the base game! Players who don't own Crusade yet can still experience smarter AI opponents, improved diplomacy, and more! More missions, more money (and probably more problems). The new missions will let you further explore the galaxy in search of wonders and resources to build up your civilization. The new "Mogul" promotion for your entrepreneurial citizens will net you 5000bc when you reach it. Score! 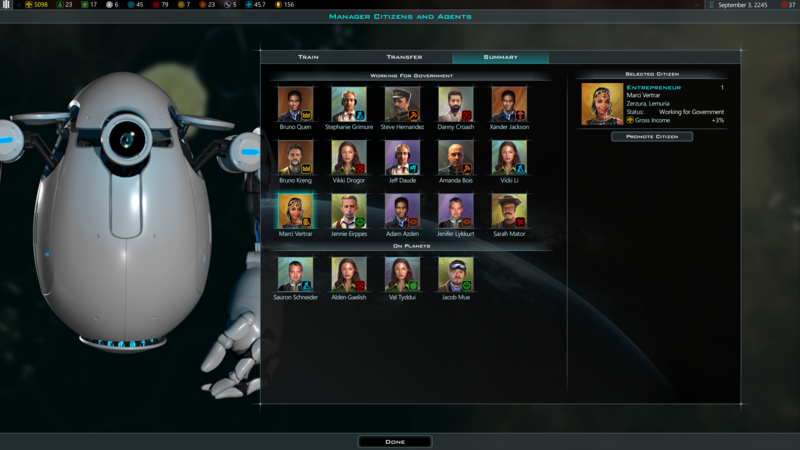 Many adjustments to the game's balance through changes to missions, bonuses, ideology, and more also feed into the improved AI. The AI is substantially better at managing domestic affairs (improvements, economy, etc. ), as well as issues abroad (waging war, exploration, etc.). 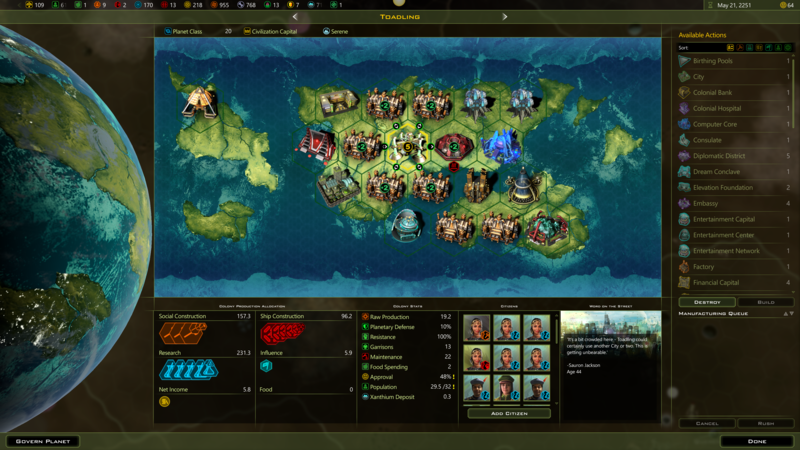 Diplomacy: The AI is much better at bargaining with players and makes more intelligent trade offers. them more expensive. Adjustments have also been made to the cost of specialty vessels such as constructors or colony ships. stars, and habitable planets have also been substantially increased. Performance: Some of the optimizations for Crusade have been ported over to create faster turn times and improve the general framerate. AI: The AI has been improved to be able to play more intelligently, especially during times of war. The v2.3 update is ready and waiting for you in your Steam client! If you haven't already joined the Crusade, the expansion is available on Steam or at Stardock. The "Certain" abilities now correctly award research points when ideological traits are unlocked. Singularity Powerplant now actually charges for Elerium. Asking someone to declare an embargo or to declare war now longer destroys the universe. Slight modification of blueprints to not require as many resource heavy weaponry. 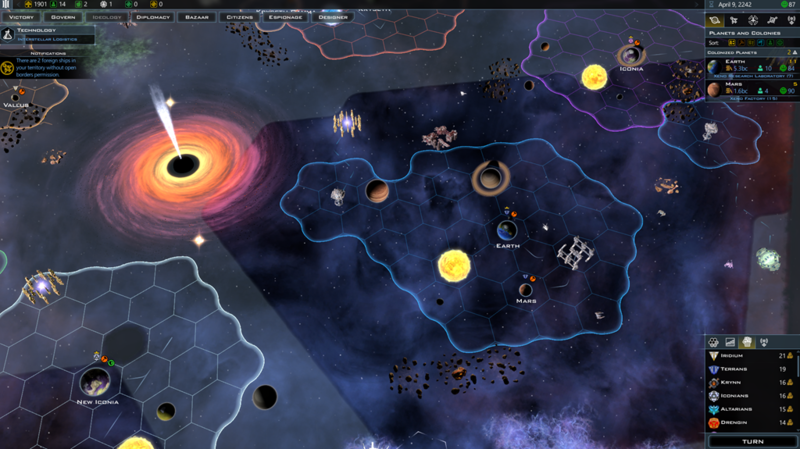 Slight increase in the amount of mining the mining modules produce per turn. Shipyard HP and defenses reduced so that players can eliminate pirates and break defenses more effectively. Nerf and Re-enable the Arbitration Center, that was disabled, making the Arbiters ideology trait useless. Update Starbase modules so their bonuses to stack, instead of upgrade. New AI governors for smarter AI planetary building. Added support for AI specific events. AI work on trying to get it to be smarter about when to make massive fleets and when to send out smaller fleets to finish someone much weaker. Lots of AI work to try to find a good balance between the AI using its military might to conquer versus when it should hunker down. This will be an endless balance war for the AI. Removed code that was blocking the AI from even looking at units that were far away that it knew about. While this made sense when performance was tight, now that this has been moved to its own thread on its own core, we don't care. More improvements to the AI guessing algorithm for where good planets are (or as novices say "AI cheating" -- it's not cheating). Big one: For the human player, 3 survey ships sitting on the same tile will go to 3 different anomalies rather than all going to the same stupid one. The AI players are very unhappy with this change. A LOT of AI work on getting the AI to sacrifice a fleet on a hardened position to soften it. The AI doesn't like to sacrifice units and marketing doesn't like it either because users will say the AI is dumb for sending weak fleets that can't possibly win. But sometimes, you have to do this to soften up the player's defenses if you have the power to spare. Eliminated the tech governor for the AI. They don't need a script on what to research. AI is better about building transports when it should and not build them when it shouldn't. What AI players build on planets is less scripted and more procedural. New code for the case when the AI can't find something to build on a planet. 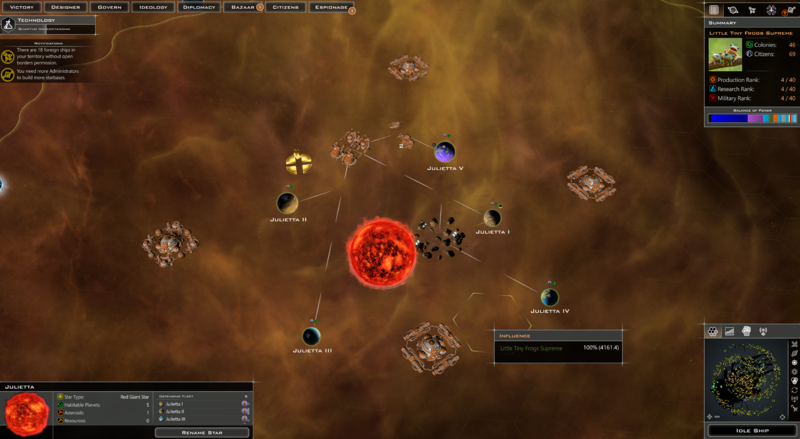 It switches to the new procedural system to figure out what to build. Eliminated last vestiges of AI scripting for trying to achieve a particular victory. You can't script a victory in a game like this. Ship tech research now weighs heavily what resources it has coming in rather than what it currently has in inventory. The AI getting lucky and finding say 5 anti-matter shouldn't dictate its weapon research choices. Warmonger penalty more intelligent. If you attack early game, you get it for awhile and if you are declaring war on a lot of players (where a lot depends on how many players are in the game) then it goes on. Pirates no longer look for danger when going to a destination because, again, quit being goddam babies. Pirates will do suicidal attacks. Pirates are no longer considered dead if they still have a shipyard. They are only mostly dead. As if the pirates are going to maintain a freaking starbase. They're pirates! New missions: Gem Trader, Pilgrimage, Xylology, and Hyper Silicates. Most starbase modules now have a +1 maintenance cost. Colonizing events that gave "Planetary Defense" now give "Planetary Resistance." Colonizers ability now grants 1 administrator point. Ancient ability provides 10 research for each anomaly that it picks up. Made the Prolific and Devout abilities global. Trade secrets bonus reduced to 25% instead of 100% for pragmatic choice. Trade Secrets ideology event nerfed from a 100% bonus to trade income to a 25% trade income bonus. Changed planetary bonuses that helped just Social Manufacturing to help All Manufacturing. Nerf some more of the base planet traits for Crusade. Yor are now 'Expansionist" instead of "Aggressive". The Yor aren't capable of being "Aggressive" by our standards. That would require them thinking of us as sentient. Arceans are now opportunistic removing the Chaotic trait (Which made them move between Neutral and Merciless). Vigilant Level 2 on the ideological tree now provides the player 3 engineers upon choosing it. Trade route diplomacy bonus increased from 0.5 to 1 for the Traders 4 trait. When a player dies, their starbases and shipyards are destroyed instead of being given to pirates. Minor change to FOW with big performance improvements. Removing a redundant stat update. Reduced starting pop on some of the campaign factions. Asteroid Mining bases should no longer change ownership. Fixed bad bonus text on several "Lost Worlds" colonizing events. Fix resource cost triggers for Singularity Power Plant. Fix incorrect descriptions on several colonizing events. Fixed missing adjacency bonuses on the Silicon based life cities. Fixed Power on the Manufacturing Focus specialization. Fix preclusion bug that allowed some one-per-planet improvements to be built multiple times. Changed Adjacency text to say Adjacency Bonus. Changed short name for Torian to Torians. Fix for bad grid lines on some Nvidia cards. Doesn't fix all cases, yet. But hey, we got some perf as well. Administrator points granted from the Colonizers ability are now properly displayed. Fixed some cases where Legion count wasn't being updated correctly. 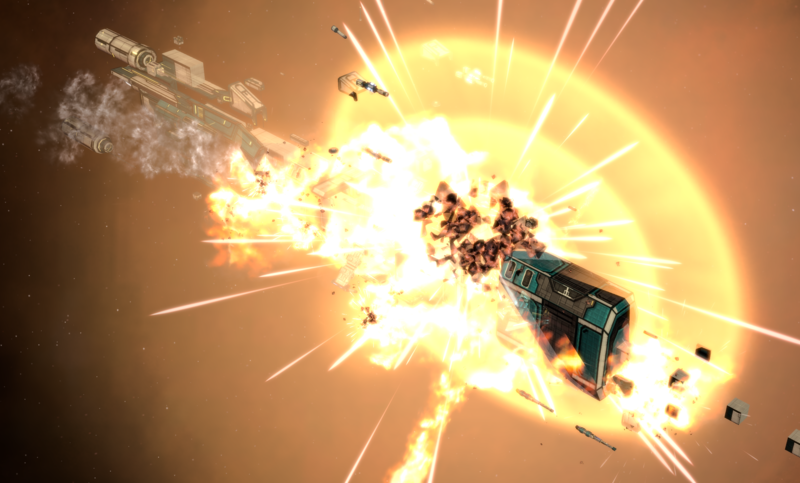 Don't refund legions after invasions for whole ships that weren't destroyed. You can no longer view non-selectable ships in the fleet details window by going next/prev. "Destroying Galaxy" loading shows up when exiting to the main menu. Tech victory alerts will no longer show up before the age of ascension. MP: Players are no longer double-charged for mercenary resources. For a list of just the base game updates, click here. Pirate AI is more aggressive. Smart auto credit bidder added to the trade window to make trading easier. Planetary Improvement cost generally made higher. Reduced manufacturing cost but increased mass of special components so that the ramp up time isn't so severe. Added new "Complete Tech" event. Thankyou, now gotta wait for it to appear on GOG. Indeed. IIRC Stardock is pretty good about sending stuff over to GOG, but their own processes can result in painful delays on occasion. I have the Steam version too, but hate being chained to Steam. My internet goes and my game goes. Also less resources being used up by the Steam client, I`m old school, etc, etc, etc. I get a "play off line" option for most games when that happens. Does it not work for GC III? I'm so fossilized that I had to google GOG, otherwise this is quite the balance pass, from what I can see. For those (seemingly) eternal textual errors, the brain tend to auto-correct (at least the) obvious typos at any rate. Now that is the true gift of the internet era... apart from how you tend to miss your own, due to that same effect... Oops... ! I mentioned other reasons too. Another reason: GoG makes me feel free as I game; it`s the way games were always played for decades before Steam-Borg arrived. There are so many reasons, including the addiction of some people to Steam which seems unhealthy. I don`t need and have never needed a 3rd party utility for my games. Like I said, I`m oldschool. I`ve put way more money into GOG than into Steam. I honestly appreciate stardock for allowing it. Has anyone experienced these problems with v2.3? Is SD ever going to include a hotkey for cycling between ships? 3. Yes, it's currently one of my top gripes about the game. A number of us have discussed it with the developers and they said they were open to a change to make it a setting, but I have not heard further from them. It turns out I had 162 corrupted files which Steam had to reaquire. Doing so fixed the above problems.